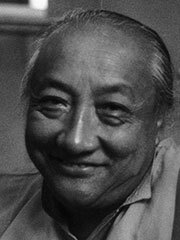 Dilgo Khyentse Rinpoche(c.1910-28 September 1991) was a Vajrayana master, scholar, poet, teacher, and head of the Nyingma school of Tibetan Buddhism from 1987 to 1991. He was born in the Denhok Valley at Kham Derge, Eastern Tibet in 1910 to a family directly descended from the ninth century King Trisong Detsen. His father was a minister to the King of Derge. When he was seven years old, he was publicly recognized as the reincarnation of Jamyang Khyentse Wangpo by Shechen Gyaltsap Rinpoche (1871-1926) at Shechen, one of the six principal monasteries of the Nyingmapa school. During the next few years Dilgo Khyentse received full schooling from various tutors, in addition to training in meditation, and in the study of the Dharma in general, and of Tantra specifically. His root Guru was Shechen Gyaltsap Rinpoche, and Dzongsar Khyentse Chokyi Lodro (1893-1959) was his other main spiritual master. After he completed what are known as the Preliminary Practices (Ngöndro), Khyentse Rinpoche spent most of the next thirteen years in silent retreat in remote hermitages and caves near his birthplace. Additionally he received teachings at Palpung Monastary from the eleventh Tai Situ Rinpoche, and full instruction on the ancient Guhyagarbha Tantra and its various commentaries from Khenpo Tubga at Kyangma Ri-tro. In all he studied with over fifty great teachers from all the various oral and practice lineages of Tibetan Buddhism. As his own teaching career developed, he became renowned within Tibet for his ability to transmit the teachings of each Buddhist lineage according to its own tradition. Later on His Holiness the Dalai Lama would regard Dilgo Khyentse Rinpoche as his principal teacher in the Nyingma tradition and of Dzogchen.In the 1950s, as rebellions broke out in Kham in response to the imposition of Chinese Communist rule, Khyentse Rinpoche and his family escaped to central Tibet, leaving behind his precious library of collected Dharma books and most of his own writings. Then in 1959, as the takeover of Lhasa became certain, Khyentse Rinpoche, his family and a few disciples decided to leave Tibet, and headed for Bhutan. The royal family of Bhutan invited him to stay there and teach, and as his reputation spread he attracted many new disciples, and he became the foremost Buddhist teacher in Bhutan. Later, as he made frequent visits to give teachings to H.H. the 14th Dalai Lama at Dharamasala in India, he began giving teachings all over the Himalayas, India, Southeast Asia and the West. His life became a continual flow of teaching, yet he found time for extensive scholarship and composed numerous poems, meditation texts and commentaries. He was also a Terton (a discoverer of spiritual treasures), discovering numerous terma and was one of the leading masters of the pith-instructions of Dzogchen, the Great Perfection, and one of the principal holders of the Longchen Nyingtik tradition. In 1980, he founded the Shechen Tennyi Dargyeling Monastery in Nepal, where he transplanted the Shechen tradition to a new home near the great stupa of Boudhanath, just northeast of Kathmandu. At this location over the years he gave many teachings, turning the wheel of the Dharma countless times for hundreds of other lamas, disciples, and students from around the world. Over this same time period, and up until his paranirvana in 1991, Dilgo Khyentse Rinpoche was involved in publishing as much of Tibet’s extraordinary heritage of Buddhist teachings as possible, over three hundred volumes altogether. By followers of Tibetan Buddhism he is regarded as having been a great teacher of teachers, a realized being, who was also remarked upon as being a genuinely good human being. His entire life was devoted to the preservation and dissemination of the Buddha Dharma and he is still regarded with awe and amazement throughout the Tibetan diaspora, and western centers of Tibetan Buddhism. His importance within the Nyingma school in the 20th century was all-pervading. He was one of the few Tibetan Lamas accorded the honorific title of » His Holiness». Following the death of Dudjom Rinpoche in 1987, he became the head of the Nyingma School, and remained so until his own death in Bhutan on 28 September 1991. Final cremation ceremonies were held for him over a three day period near Paro in Bhutan, in November 1992 and were attended by over a hundred important lamas, the Royal Family and ministers of Bhutan, five hundred western disciples and a huge crowd of some fifty thousand devotees.